It’s almost the end of 2018 and, while there is still one or two big name games coming out for PlayStation 4 and PS4 Pro ahead of the holiday season, it’s time to look forward to next year. There are some amazing games we know about, coming early 2019 and beyond so we’ve rounded up our favourites for you to stick on your wishlist. We’ve included release dates and trailers for each game, to give you all the info you need. You’ll find them listed in chronological order. Rico Rodriguez is back in a new, larger open world adventure than ever before. Fans of the series will also applaud the fact that enemy AI is claimed to have been dramatically overhauled – they were mostly dumb in the last outing. Let the mayhem begin. Not just a remaster but a remake from the ground up, Resident Evil 2 will have an enhanced narrative and modern day graphics. It will even be presented in 4K HDR on the PS4 Pro. Sora, Donald Duck and Goofy are back in the latest in the bizarre but brill mix of the Final Fantasy and Disney universes. New worlds to explore include Toy Story, Pirates of the Caribbean and Frozen. This new IP from Bioware mixes robots and monsters together in a third-person mission-based adventure which looks like a mixing pot of Fallout 4, Titanfall 2, Horizon: Zero Dawn and the studio’s own Mass Effect. And we mean that in a good way. The vast open-world format and the way it can be flown through is a spectacle to behold. Unfortunately, it was pushed back to an early 2019 release but February is fast approaching. The follow-up to Metro: Last Light proves that we can’t keep our gaming hands off the post-apocalyptic future. Not that we’re complaining, Metro: Exodus looks stunning – while ensuring its fair share of frightening scares too. Monsters versus man, with limited supply of ammo, this first person shooter looks as though it could be a genuine thrill. Sadly, it too was put back until early 2019, but some of the best things are worth waiting for. The Division decamps to Washington DC for the sequel and, from what we’ve seen so far, has similar duck and cover, multiplayer melees as before. It took a while for the first game to warm up, so we’re hoping that lessons have been learned and the second hits the ground running. Literally. One of Activision’s big surprises of E3 2018 is one of the big games for spring 2019. Sekiro: Shadows Die Twice is by FromSoftware – the same developer as Dark Souls and BloodBorne – so you’ll know roughly what to expect if you’ve ever played either of those. It is an action-adventure game with rock-hard bosses and strategical gameplay combined. We can’t wait to get our hands on it fully. Days Gone was the surprise reveal at the 2016 Sony E3 pre-show conference and although it’s taking its sweet merry time, the game is looking better and better each time we see it. The story, set in a seemingly post-apocalyptic world, follows a badass biker trying to survive in a zombie-laden land. Cue interspersed sections of his past playing on his mind and there’s the crucial balance of story and third-person shoot-’em-up. The real standout tech in the game, though, is just how many zombies are depicted on screen. Sadly, you’ll have to wait until spring 2019 for it, but it’ll hopefully be worth it. This direct sequel to DmC 4 sees a return for Dante and Nero as playable characters and more demons to battle against than ever before. From what we’ve seen so far, it also really looks the part on the modern consoles. Sonic Racing has always been one of our favourite karting franchises aside from Mario Kart so we’re thrilled it’s coming back in the form of Team Sonic Racing for modern consoles. It promises to have a hefty cast list of characters to play as, plus all-new team racing modes; hence the name. The Shenmue series gets a third game at last, only 17 years after Shenmue II first came out. It is being developed thanks to a hugely successful crowdfunding campaign on Kickstarter and the plot turns back to martial artist Ryo Hazuki, who picks up on his quest to find his father’s killer. The latest trailer, which debuted during E3 2018 is the first with actual gameplay footage. It also shows the sequel to Naughty Dog’s superlative horror game will not be for the faint hearted. Be wary when watching the above, it’s full of extreme violence. But it does its job well in making us want to play The Last of Us 2 even more – if that was indeed possible. One of our favourite zombie games of the last decade returns with more first-person parkour fun and even scarier night time runs. One of the other new features is a dynamic game world that shifts and changes based on your choices during key missions. Your game, therefore, can end up being very different from another player’s. With Assassin’s Creed: Black Flag already under its belt, Ubisoft is no stranger to the world of pirates – which gives us more than an inkling that this is going to be one very well received game indeed. Skull & Bones is a multiplayer game which takes you to the seas – where you’ll need to use co-operative play to sink your competitors’ ships and get the best loot possible. Developed by Avalanche Studios – the same team behind the underrated Mad Max – Rage 2 looks to take the post-apocalyptic FPS to a whole new level. We are very much impressed by everything we’ve seen so far. Announced during E3 in June 2017, Beyond Good and Evil 2 is long overdue, considering the first was released over 15 years ago. The game’s other-world setting – where multiple species communicate and interact – is quirky, cheeky and stunning. Think The Fifth Element in video game form and you’re half way there. Starring BJ Blazkowicz’s twin daughters, this sequel to Wolfenstein II is a co-op shooter that promises just as much madcap mayhem as the other recent games in the series. There’s no exact release date for now, but we’ll update when we find out more. Remedy is back and this time is developing a game that’s cross-platform, including PS4. The studio behind Alan Wake and Quantum Break revealed Control during E3 2018 – a mystery game about a strange, shifting headquarters and the head of the Bureau of Control, Jessie Faden. It looks clever, interesting and, typical for Remedy, different to everything else out there. Based on the film rather than the books, World War Z will be one of many zombie games out 2019 but promises four-player co-op in the third-person shooter style. We don’t know that much about the gameplay, but you can be assured of one thing: there will be thousands of undead denizens trying to eat your face off. A PS4 exclusive originally announced during Paris Games Week in 2017, Concrete Genie is an interesting mix of platforming and creative play. It’s definitely shaping up nicely, based on the E3 2018 gameplay demos and while we’re still waiting for an official release date, we are lead to believe that it’s coming this year. 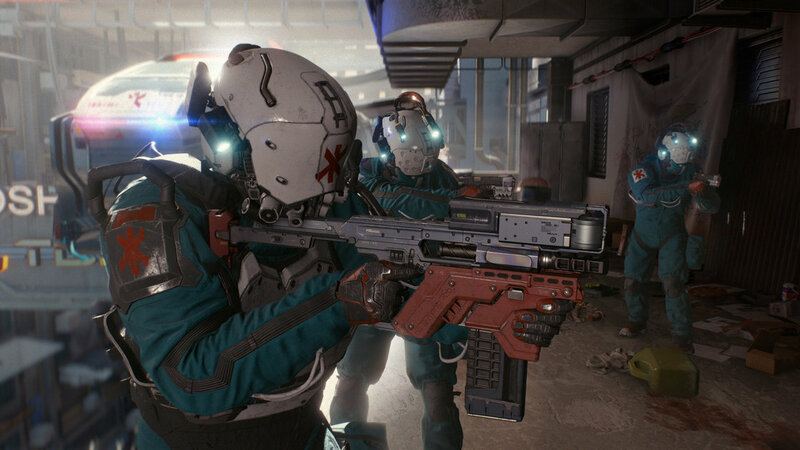 Possibly coming in 2019 but there are no guarantees, Cyberpunk 2077 was by far and away the best game shown at E3 2018. We sat through a 50 minute demo of gameplay and our mouths were agog for the entire time. The open world RPG is quite simply gorgeous, with no loading times and seamless transitions between huge areas as you travel the futuristic city. When it was announced during Paris Games Week in 2017, Ghost of Tsushima took many by surprise. We found out more from this E3 gameplay reveal trailer. It is an all-new intellectual property being developed by the team behind the Infamous series, Sucker Punch, and looks stunning. How do you follow up the Metal Gear Solid series now you’re no longer involved? By making the oddest, most disturbing survival horror game on the planet, that’s how. Or, at least, that’s what we think Hideo Kojima is up to. Even three full trailers in, we still can’t make heads nor tails of the gameplay at the moment. After Bethesda’s official Quakecon event we finally got to see full gameplay of Doom Eternal and lordy does it look good. You can see it for yourself above. We know nothing about Starfield apart from the fact that it will be the first all-new IP from Bethesda Softworks for 25 years. Some are suggesting that it will be a sci-fi epic RPG: Skyrim in Space, basically. Never has a logo created so much excitement. The sequel to Skyrim might not even be for this generation of consoles, but we’re still tingling with anticipation nonetheless.